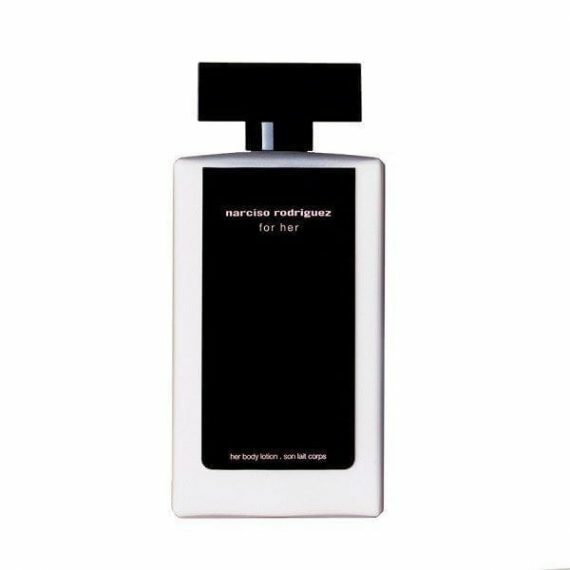 For Her by Narciso Rodriguez is a musky feminine Body Lotion with top notes of Rose and Peach. The heart notes are Amber and Musk with a base of Patchouli and Sandalwood notes. It has a pure and luminous scent for a youthful woman. The predominant note is Musk and the fragrance is long lasting. The scent was launched in 2006 in a 200ml black glass bottle. The fragrance is also available as an Eau de Parfum, Eau de Toilette, l’eau Eau de Toilette, l’absolu Eau de Parfum and Body Lotion. A moisturising lotion that delicately perfumes the body with notes of for her. Its silky texture is rapidly absorbed. It leaves the skin supple and moisturised* thanks to its formula containing vitamin F.* moisturises the upper layers of the skin.